Among Picasso’s most celebrated likenesses of his lover Marie-Thérèse Walter, Woman with a Book balances sensuality and restraint, enclosing exuberant, thickly applied color in a network of sinuous black lines. The composition pays homage to the Neoclassical master of line, Jean-Auguste-Dominique Ingres, whose work Picasso had admired since his youth, and whose Portrait of Madame Moitessier the Spanish painter had first encountered in 1921. Resting his model’s head on her hand, and replacing Madame Moitessier’s fan with the fluttering pages of a book, Picasso tapped into the eroticism latent beneath Ingres’s image of bourgeois respectability. The serene profile reflected in a mirror at right in Picasso’s portrait likewise references its Neoclassical precedent but may also constitute an abstract self-portrait. Looking up from her reading, a solitary young woman gazes into the distance, lost in dreamy reverie. The compressed space results from Picasso’s emphasis on strong flat pattern. Everything is kept close to the surface, heightening the feeling of intimacy—a feeling not surprising, since the sitter is Marie-Thérèse Walter, Picasso’s mistress and chief model from 1927 until 1936. In this striking portrait, Picasso creates a study in contrasts. He captures a private moment, using dramatic colors and curving lines for emotional impact. While the mood is restrained, Marie-Thérèse’s figure is voluptuous and enticing. And while the pitch-black outside the window tells us it’s nighttime, an artificial light glows brightly inside. Picasso applied heavily textured paint in exuberant strong colors—each segment defined by heavy black outlines that flow in sweeping curves to delineate the body, dress, and upholstered armchair. You may think this painting looks strange—but it shows a real woman named Marie-Thérèse. She had a round face and straight hair, and she liked to sit quietly, reading. Pablo Picasso, who painted this picture, was very much in love with her. So why did he give this blond woman green hair? And cut her up with black lines, like a jigsaw puzzle? Maybe because he was in love with painting too. 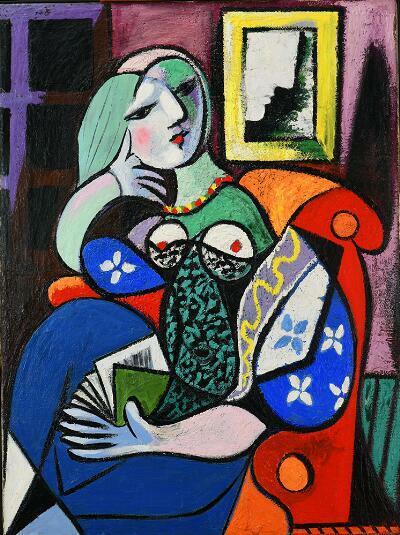 Pablo Picasso was one of the most important artists of the 20th century. He once said, “I paint objects as I think them, not as I see them,” and this picture gives us an idea of what he meant. When he thought of Thérèse, he thought of the softness and roundness of her body—so whenever he painted her, he used lots of curving lines. And he’s enjoying using lots of different colors, patterns and interesting shapes too. Check out the hand on her lap—the way her fingers spread out like the pages of the book she’s holding. As a child, Picasso found it easy to make things look real. Once, he amazed his friends by drawing a perfect picture without lifting his pencil or looking at the paper! When he grew up, he felt that he could use color and line to tell us what he felt about a person, and show us how beautiful colors and lines are too. Still, some things remain a mystery. Did you notice the white profile in the yellow frame? Is it a reflection of the woman in the picture? Is it a painting hanging on the wall? Or is it a window with someone peeking in? Some people think it’s Picasso’s way of putting himself in the painting!